Wow Pot is a very popular online progressive slot machine developed by Microgaming, the leading online casino and gaming software provider. 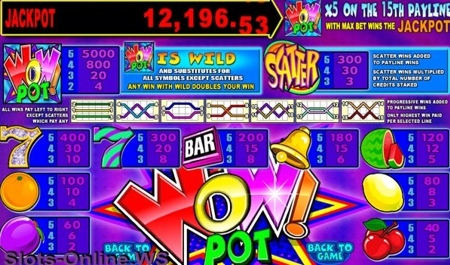 Originally released, WowPot is a $0.50 cent, three reel, three coin slot game with a single line payout and is connected to dozens of online casinos at the same time. You should bet max 3 coins per spin to activate progressive jackpot feature and have a chance to win the progressive. 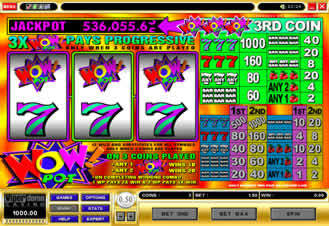 Now players can find 5 reel 15 pay-line version of Wow Pot with enhanced graphics and increased winning combinations. In 5 reel version you can can bet a maximum of 15 coins per spin (one coin per line), that way you'll have a chance to hit qualify for the progressive jackpot. A single WowPot symbol is Wild and doubles the payout of any combination it completes. There is also a Scatter symbol that does not need to appear on an enabled payline to win. It can be scattered anywhere on the five reels, provided three or more Scatter symbols appear on the screen. WowPot accumulates deposits from players at dozens of participating Internet casinos and creates a single, big jackpot. Wow Pot software enables players to obtain their game play history for up to a week period after they have finished playing. The largest WowPot progressive jackpot ever won by players was almost $102K. We have collected over 80 Wow Pot jackpot winners stories and testimonials - check out these real winners that share their experience.